Haeinsa is one of the foremost Buddhist temples in South Korea, most notable because it is the home of the Tripitaka Koreana, the whole of the Buddhist Scriptures carved onto 81,258 wooden printing blocks. Haeinsa is one of the Three Jewel Temples of Korea, and is located on Gaya Mountain in South Gyeongsang Province. 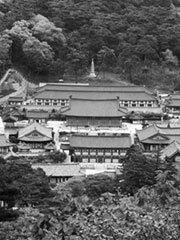 It is still an active Seon practice center in modern times, and was the home temple of the influential Rev. Seongcheol, who passed away in 1993. The temple was first built in 802. Haeinsa and the Tripitaka Koreana were added to the UNESCO World Heritage list in 1995.